Barnsley registered their first home league victory since September with a win over fellow strugglers Blackpool. Sam Winnall headed in from close range before Mark Cullen struck back for Blackpool after the break. 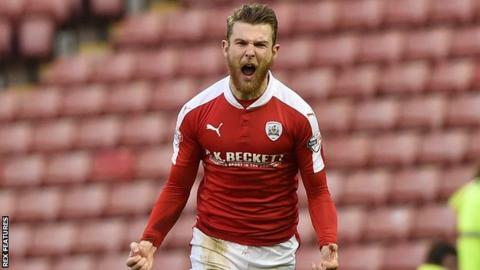 Winnall tapped home Lloyd Isgrove's cross as Barnsley regained the lead before Marley Watkins slotted a third. Andy Little's late strike gave Blackpool hope but Matt Templeton fired low into the bottom corner as the Tykes moved out of League One's drop zone. Prior to the game, Barnsley confirmed the signing of 17-year-old left-back Rhys Dolan from non-league Ilkeston Town for an undisclosed fee, on a contract to run until the summer of 2018. Match ends, Barnsley 4, Blackpool 2. Second Half ends, Barnsley 4, Blackpool 2. Substitution, Barnsley. Michael Smith replaces Marley Watkins. Attempt saved. David Norris (Blackpool) right footed shot from outside the box is saved in the top centre of the goal. Goal! Barnsley 4, Blackpool 2. Matthew Templeton (Barnsley) left footed shot from outside the box to the bottom right corner. Assisted by Ben Pearson. Bright Samuel (Blackpool) wins a free kick on the left wing. Foul by Reece Wabara (Barnsley). Goal! Barnsley 3, Blackpool 2. Andy Little (Blackpool) right footed shot from the centre of the box to the bottom left corner. Substitution, Barnsley. Matthew Templeton replaces Adam Hammill. Corner, Blackpool. Conceded by Adam Davies. Attempt saved. Jarrett Rivers (Blackpool) left footed shot from the centre of the box is saved in the centre of the goal. Kevin Long (Barnsley) is shown the yellow card for a bad foul. Foul by Kevin Long (Barnsley). Mark Cullen (Blackpool) wins a free kick in the defensive half. Brad Potts (Blackpool) is shown the yellow card. Sam Winnall (Barnsley) wins a free kick in the defensive half. Mark Cullen (Blackpool) is shown the yellow card for a bad foul. Alfie Mawson (Barnsley) wins a free kick on the left wing. Ben Pearson (Barnsley) wins a free kick in the defensive half. Foul by Bright Samuel (Blackpool). Attempt missed. Bright Samuel (Blackpool) header from very close range is just a bit too high. Attempt missed. Sam Winnall (Barnsley) right footed shot from outside the box is close, but misses to the left. Attempt saved. Andy Little (Blackpool) header from the centre of the box is saved in the top right corner. Substitution, Barnsley. Ryan Williams replaces Lloyd Isgrove. Substitution, Blackpool. Andy Little replaces Elliot Lee. Ben Pearson (Barnsley) wins a free kick on the left wing. Foul by Hayden White (Blackpool). Adam Hammill (Barnsley) wins a free kick in the defensive half. Corner, Blackpool. Conceded by Alfie Mawson. Attempt missed. Adam Hammill (Barnsley) right footed shot from the left side of the box is too high. Corner, Barnsley. Conceded by Jarrett Rivers. Attempt missed. Elliot Lee (Blackpool) right footed shot from the centre of the box is just a bit too high. Substitution, Blackpool. Bright Samuel replaces David Ferguson. Substitution, Blackpool. Jarrett Rivers replaces Jim McAlister. Conor Hourihane (Barnsley) wins a free kick in the attacking half. Goal! Barnsley 3, Blackpool 1. Marley Watkins (Barnsley) right footed shot from the centre of the box to the bottom left corner. Assisted by Sam Winnall.